Cleveland, Ohio- One streak had to go on and one had to end on Wednesday night. Fortunately for the Rockford IceHogs, it was their winning streak that continued as they topped the red hot Lake Erie Monsters 3-2 at the Quicken Loans in Cleveland. The win for Rockford ended the Monsters franchise record eight-game winning streak while Rockford has now won a season best five straight tilts. Last time Rockford was in Lake Erie on March 5, they ended the Monsters franchise record eight-game home winning streak by a score of 3-2, the last lost for Lake Erie before Wednesday. Rockford controlled the first six minutes of the game, but it was Lake Erie who grabbed the first goal. Julian Talbot snapped home his 12th goal of the season over the shoulder of Hannu Toivonen at 5:59 of the opening frame on Lake Erie’s first shot of the contest. The Monsters goal didn’t slow Rockford’s momentum, however, as they tied the game at 16:23 of the first period. Defenseman Garnet Exelby picked up a Brandon Pirri pass and slapped his third goal of the season past Jason Bacashihua for his third goal of the campaign. Rob Klinkhammer also assisted on the goal to extend his point streak to seven straight games. In the second period Lake Erie reclaimed the lead. With Rockford pinned in their own zone, Matt Ford deflected a Talbot shot over the shoulder of Toivonen for his 22nd goal of the season just 1:33 into the second frame. With time winding down on a power play, Jeff Taffe would tie the game with a blast at 17:03 of the second stanza. Ben Smith helped Rockford hold the offensive zone and slid a pass down the left wall to Klinkhammer. Klinkhammer found Taffe in the slot and the winger hammered home his team-leading 26th goal of the season, making it 2-2. The IceHogs claimed their first lead of the game 4:57 into the third period. Chris DiDomenico found Brian Connelly trailing a transition rush and the d-man cranked his ninth goal of the year past Bacashihua to put Rockford on top 3-2, the eventual game winner. Toivonen extended his personal road point streak to six-straight games (4-0-1-1) making 23 saves , while Bacashihua made 24 saves in the lost. FROM PRESS RELEASE - LOVES PARK, Ill. – A former Rockford RiverHawk has turned up in a big-league box score. Relief pitcher Justin Dowdy pitched for the San Francisco Giants in their 15-3 loss to Kansas City last Friday in a spring-training game Surprise, Ariz. Dowdy pitched a third of an inning and gave up run-scoring singles to the Royals’ Wilson Betemit and Mitch Maier. Dowdy, who pitched for the RiverHawks in 2003-04, was a two-time Frontier League All-Star. Dowdy, who was drafted by the Chicago White Sox in 2001, is with his seventh major-league organization. He has also pitched for the San Diego, Seattle, Anaheim, Oakland and Tampa Bay organizations. Dowdy signed with the Rays late last season and was plucked off the Class AA Montgomery roster by the Giants in the minor-league phase of the Rule V draft. The southpaw holds a unique distinction – he’s the only RiverHawk to be signed off the Rockford roster on two different occasions. He was signed by the Mariners at the 2003 all-star break and by the Angels at the break the following season. Dowdy is believed to be the second former RiverHawk to play in a major-league exhibition. Jason Jamesplayed in one game for the Chicago Cubs last spring. Dowdy is one of four former RiverHawks in affiliated camps this spring. Infielder Jake Eigsti is with the Royals, catcher Travis Scott with Pittsburgh and pitcher Taylor Sinclair is in Arizona’s minor-league camp. Rockford, Ill. - Chicago Blackhawks General Manager of Minor League Affiliations Mark Bernard announced on Tuesday that the American Hockey League's Rockford IceHogs have signed right wing Jimmy Hayes an amateur try-out agreement. Additionally, rookie forward Chris DiDomenico has been reassigned by Chicago to Rockford and left wing Andy Bohmbach has been recalled by the IceHogs, both from the ECHL's Toledo Walleye. Also, winger Mike Hedden was signed to a professional try-out agreement by Rockford. Hayes was drafted by the Toronto Maple Leafs in the second round (#60 overall) in the 2008 NHL Entry Draft before being traded to Chicago in exchange for a second-round pick on June 26, 2010. The Dorchester, Mass. native recently completed his junior season at Boston College (NCAA). The 21 year-old ranked second on the team with 21 goals and tied for third with 33 points. In three years with the Eagles, Hayes accumulated 81 points (42g-39a) in 117 contests. DiDomenico, 21, has played in 20 games with Rockford during his first professional season and has an assist with six penalty minutes. The Woodbridge, Ont. native was originally drafted by the Toronto Maple Leafs in round six (#164 overall) in the 2007 NHL Entry Draft. With Toledo, DiDomenico has 9g-16a-25pts and 31 PIM in 37 games played. Bohmbach, 23, has skated in five games for the IceHogs in 2010-11, recording two assists and four shots on goal. The Hudson, Wisconsin native leads the Walleye with 68 points (25g-43a) in 62 games in his first professional season. Hedden, 26, is fifth on the Walleye with 46 points (29g-17a) through 54 tilts. The Dunnville, Ont. native registered 18g-14a-32pts in 66 games with Toledo and notched an assist in three games with Grand Rapids in 2009-10. The IceHogs begin a four-day, nine-day road trip on Wednesday in Lake Erie against the Monsters at 6 p.m.
Next Home Game: Friday, April 8 vs. Lake Erie Monsters: The puck drops at 7:05 p.m. Rockford returns home after a five-game, 12-day road swing to take on the Lake Erie Monsters for the sixth and final time this season. The IceHogs will be celebrating Hammy's birthday with several area mascots as the team opens the final weekend of the 2010-11 season. First time back in Rockford since 2007! Catch bar to bar dirt bike racing as Tyler Bowers, Chad Johnson, Jeff Gibson and others battle it out in the final race before the Arenacross Championship. Filled with difficult challenges, amazing airtime, intense speed, and close-contact racing, Arenacross tracks are among the tightest in the world. See what happens when Arenacross comes to the MetroCentre and catch a special racing appearance by Pearl City’s Tom Hofmaster! PLUS bring your Friday or Saturday Arenacross ticket stub to the Box Office to save $5 on tickets for Sunday’s Amateur Race Day, opening at 10:00AM! *Additional fees and charges may apply. Rockford, Ill.-The Rockford IceHogs are proud to announce that Kyle Hagel has been named the team’s winner of the IOA/American Specialty AHL Man of the Year award for his outstanding contributions to the Rockford community during the 2010-11 season. The highlight of Kyle’s commitment to the Rockford community was the “Stick To Reading Program” that he established at Kishwaukee Elementary School in Rockford. Kyle made ties with Mrs. Nicole Adams, a fifth-grade teacher at Kishwaukee Elementary School, and set up the program that encouraged the students at the fourth and fifth grade levels to improve their reading habits. "Kyle is probably the most determined man that I have ever met in my life,” said Mrs. Adams. “I think what’s really impressive to me through the whole thing is that he volunteered this. You know I wasn’t pushing for someone to come into my classroom. I was kind of teasing him and he said ‘no I’m really serious’. “He explained about Hockey Players for Kids (HP4K) and how that’s a completely voluntary organization and how important it is for him to feel like he is giving back to his community, even though this is not his home. “While he’s here playing for the IceHogs, this is his community. So he is determined to do as much as he can to impact Rockford and that’s remarkable. He was always very gracious with the kids"
Not only did Kyle organize the “Stick To Reading Program” on his own through HP4K, but he included several of his IceHogs teammates in the program and the players made several appearances at Kishwaukee Elementary School. The program began with a kickoff assembly with the fourth and fifth grades and included Kyle and five other IceHogs players at the school to help motivate the kids. Throughout the process, Kyle and his teammates made appearances at the school and capped the program with a floor hockey game featuring the winners of the “Stick To Reading Program” and nine other IceHogs players in front of both the fourth and fifth grade classes. “We had a number of students who normally wouldn’t read get involved in the program and it definitely exceeded our expectations,” said Kishwaukee Elementary School Principle Al Gagliano. Outside the schools, Kyle was always one of the first to volunteer for hospital visits or to help out at Jr. IceHogs Youth Hockey practices. Hagel is now one of 30 finalists for the AHL’s 2010-11 Yanick Dupre Memorial Award, honoring the overall IOA/American Specialty AHL Man of the Year. The league award is named after the former Hershey Bears forward and AHL All-Star who died in 1997 following a 16-month battle with leukemia. The winner of the Yanick Dupre Memorial Award will be announced by the American Hockey League in the coming weeks. Loves Park, Ill. - The RiverHawks are seeking families interested in housing a player for the 2011 season. This unique experience will allow a family to get to know a player beyond the field and allow them the insight of the player's everyday life. Players may be assigned housing as early as the first week of May. Pending the length of the postseason, players may be in homes as late as mid-September. Host families can enjoy many benefits in exchange for providing room and board: up to four season tickets (depending on household size), a VIP parking pass, a discount card for purchases in the team store, and monthly picnics with the whole team, all exclusive to host families. Many host families have developed relationships with players that have lasted long beyond the players' days in Rockford. Families interested in the program should contact assistant general manager for baseball operations Todd Fulk at (815) 885-2255. Opening Night for the RiverHawks' 10th season is 7:05 p.m. Thursday, May 26, when they host Schaumburg. Advertising and ticket information is available by calling (815) 885-2255. Fans can also visit www.rockfordriverhawks.com. Wednesday, March 30 at Lake Erie Monsters: Face-off is set for 6 p.m. The IceHogs return to the Quicken Loans Arena for the third and final time this season to take on the Monsters. The game kicks off a nine-day road trip for Rockford that concludes on April 6. The game is the fifth of six overall on season between Rockford and Lake Erie. Friday, April 1 at Oklahoma City Barons: Game starts at 7:05 p.m. Rockford makes their final stop in Oklahoma City to take on the Barons at the Cox Convention. The game is also the final of six on the campaign between the IceHogs and Barons in 2010-11. Rockford split their first two games in Oklahoma City New Year’s weekend. Sunday, April 3 at Texas Stars: The puck gets on the ice at 5 p.m. The Hogs final road trip continues in Cedar Park, Texas against the Texas Stars. The contest is the sixth and final on the campaign between the two clubs and Rockford is 2-1-1-1 against Texas this season. Rockford, Ill.- Chicago Blackhawks General Manager of Minor League Affiliations Mark Bernard has announced that rookie forward Chris DiDomenico has been reassigned by the Blackhawks from the ECHL’s Toledo Walleye to the American Hockey League's Rockford IceHogs. DiDomenico, 21, has played in 19 games with Rockford during his first professional season and has an assist with six penalty minutes. The Woodbridge, Ont. native was originally drafted by the Toronto Maple Leafs in round six (#164 overall) in the 2007 NHL Entry Draft. Since joining Toldeo on Jan. 6, DiDomenico has 9g-16a-25pts and 31 PIM in 37 games played. The winger was acquired by the Blackhawks on June 30, 2010 along with Victor Stalberg and Philippe Paradis from the Maple Leafs in exchange for Kris Versteeg and Bill Sweat. Even though the Rockford Foresters' baseball season doesn't start until Friday, June 3, Marinelli Field has already begun hosting baseball games and tournaments. Last Friday, Winnebago High School played their first baseball game at Marinelli Field for their 2011 baseball season. Over three dozen baseball games and baseball tournaments will be played from now until Opening Day. Marinelli Field is open for business already and we couldn't be happier! $30 = ROCKFORD FORESTERS HAT, T-SHIRT & TICKETS TO SIX DIFFERENT GAMES! Did you know that the Rockford Foresters $30 game package is the best value for baseball in the Stateline? We have sold just over five dozen of these packages already and the sales have just begun. For $30 you get a Rockford Foresters hat with the secondary logo, your choice of any Rockford Foresters t-shirts, and a classic seat ticket to six different games (a $69 value!). The best part? YOU get to choose all six games you want to attend! To order your $30 Rockford Foresters game package, email us at tickets@rockfordforesters.com or call the box office at (815) 312-2115. REMEMBER, THE ROCKFORD FORESTERS 5K RUN IS COMING! The 1st Annual Rockford Foresters 5k Run is less than five months away (Saturday, August 13). Click here for more information. I'm sure we won't stop talking about it until it actually happens. PRESS RELEASE - The Rockford Foresters Baseball Team is happy to announce today that 100% of ticket sales from two Opening Weekend games will be donated to Rockford Sharefest. The two games will be taking place on Saturday, June 4 at 6pm and Sunday, June 5 at 4pm. All tickets purchased through the Rockford Foresters as well as through Rockford Sharefest will have 100% of the money going back to Sharefest. As an added bonus, ALL tickets in the stadium will only be $5. In addition to this awesome partnership between Rockford Sharefest and the Rockford Foresters Baseball Team, all volunteers participating in Rockford Sharefest will get a voucher for a free ticket to a Rockford Foresters game at Historic Marinelli Field between July 8 - 10. An official press release and announcement will be made later in the Spring. Want to know more about Rockford Sharefest? Click here. GERMAN VALLEY - In a game where both teams had clutch hit after clutch hit, it seemed fitting that the last two runs were scored with two outs. In celebration of its 10th season, the RiverHawks are offering fans the chance to decide who is the greatest player in team history at each position, from starting pitcher to shortstop to outfield. Votes can be cast at the team website, www.rockfordriverhawks.com. Voting will switch to a new position approximately every 7-10 days. Winners will be announced at the end of each voting period and all will be acknowledged at a game this summer with an all-time RiverHawks poster, co-sponsored by Lou Bachrodt Chevrolet and The Hemmens, to be given out at a game to be announced. Joe Anthonsen (2006-08) - Anthonsen hit .352 with a team-record 135 hits to win the 2008 Frontier League batting title. The leadoff hitter also scored a team-record 79 times that year. In the team's all-time records book, Anthonsen in third in runs (170) and steals (67) and fourth in hits (309). In 2007, Anthonsen's .974 fielding percentage led league second basemen. Jake Eigsti (2010) - Eigsti hit .253 with a career-high 11 home runs and 52 RBI last year. He's just the second middle infielder in team history to reach double digits in home runs. Eigsti signed with the Kansas City Royals earlier this month. Shaff Elkouri (2003-05) - Elkouri hit .300 in two of his three seasons and was a member of the 2004 pennant-winning club. Doug Sanders (2009) - Sanders hit .289 in his only Rockford season. He was also among league leaders in fielding percentage, assists and errors. Kiley Vaughn (2003-04) -Vaughn, another defensive wiz, had a .978 fielding percentage and committed just 11 errors while at second base in his two years with the RiverHawks. He led Frontier League second basemen in fielding percentage in 2003 and was an all-star at the position in 2004. Players are eligible to be nominated at more than one position. Vaughn was also a finalist at shortstop. Lou Bachrodt Chevrolet of Rockford is Winnebago County's premier Chevy dealer. Lou Bachrodt is located near Cherryvale Mall, just minutes from the stadium. Voters can view a player's statistics online by clicking on the player's name at the poll. Opening Night for the RiverHawk's 10th season is 7:05 p.m. Thursday, May 26, when they host Schaumburg. Advertising and ticket information is available by calling (815) 885-2255. Fans can also visitwww.rockfordriverhawks.com. Rockford, Ill. – Another promotion-packed weekend is on the slate for the Rockford IceHogs on Friday and Saturday at the Rockford MetroCentre. The IceHogs open the weekend by hosting the Hamilton Bulldogs on Friday, March 25 at 7:05 p.m. The first 2,500 fans past the gates will receive an IceHogs gym bag courtesy of Kanga Roof, Members Alliance and Comcast. Cylinder 6, a rock band from the Chicago area, will entertain fans before the game, during intermissions and briefly following the contest. The Hogs will also honor the 15-time state champion Rockford Icemen with a ceremony before the game. The Icemen took their 15th straight championship with a 4-0 win against Waubonsie Valley in the finals of the AHAI/Blackhawk Cup High School Combined Varsity Division on Thursday, March 17. On Saturday, the IceHogs close out their 10-game season-series with the Milwaukee Admirals. The puck drops at 7:05 p.m. The first 2,500 fans into the building will pick up an IceHogs dry erase board compliments of Rock Valley College, FOX 39 and BOB FM. The IceHogs will also break their all-time attendance record on Saturday. The mark was set in 2009-10 when the IceHogs saw an average of 3,978 fans pass through the turnstiles each game, totaling 159,132 on the campaign. This season 153,539 fans have come out to the MetroCentre to cheer on the IceHogs with four home tilts remaining in the regular season. For tickets to the game call (815) 968-5222, visit icehogs.com or stop by the MetroCentre Box Office open noon-5 p.m. Don’t forget to follow the Hogs on Facebook and Twitter (@goicehogs) for team news, special ticket offers and discounts. PRESS RELEASE - The Rockford Foresters are happy to announce two brand new promotions for the 2011 season, which are both sponsored by AllegiantAir. The Vegas Giant Dice Toss and the Orlando Beach Race, which will both take place between two different innings during the 2011 season at each regular season home game. The winner of each in-gamepromotion will be given two tickets to the last game of the season and their names will be entered into a drawing with other winners of each of the promotions. At the last game of the 2011 regular season, the Rockford Foresters will pull a winner for the Vegas Giant Dice Toss promotion and the Orlando Beach Race promotion. Each winner will win a pair of airline tickets on AllegiantAir where ever they fly to from the Chicago Rockford International Airport. Beloit, WI, March 22, 2011 -- On April 2nd, 2011, the Beloit Memorial High School Knightingale's will host their 2nd Annual "Rhythm of the Knight" Dance/Step Showcase in the Beloit Memorial Auditorium. The doors open at 6 PM and the show starts promptly at 7 PM. The show will feature dance teams from around the community, including the Boys and Girls Club Spirit Squad, Edison Middle School Flawless Dance Team, Stylez Unknown Crew Break Dancers, the Knightingale's Cheer Campers, and many more. In addition, the Greek fraternities and sororities from UW-Whitewater will bring their steps and strolls and of course the Knightingale Step Team. The show is being hosted by Shedrick Daniels, a member of Alpha Phi Alpha Fraternity, Inc. There will be a very special appearance by Saltare, a group from MTV's America's Best Dance Crew. Join us for a fun night of dancing and stepping for the entire family. Saltare, a unique dance team was on Season 5 of America's Best Dance Crew. The group has six members from the USA Jump Rope All Star Team. They incorporate jump rope with dance to expose the sport they have participated in since childhood. Tickets are on sale for $10 per person. Children six and under are only $5. Call 608-361-3197 for more information or tickets. The Knightingales are the cheerleaders and dance team during basketball season. They cheer for boy's games and dance at half time. The Step Team travels around the Midwest performing at community events and mentoring other girls in the principles of leadership, teamwork, and community service. They have worked extremely hard to bring a positive name to Beloit and are looking forward to their showcase. They fundraised upwards of thousands of dollars to sponsor this event. The Rockford Foresters are ordering new merchandise for 2011. Before we place our final order, we want to offer all the fans a special discount. Save 15% off of our normal prices on our new items by placing your order by April 29. If you are a season ticket holder, you get an additional 5%! Click here and take an up close look at a few of the new items we will be carrying this upcoming 2011 season. New items include a premium pennant, a key ring, travel mug, lanyard and a car flag. Soon we should have the mock ups on the other new items we will be ordering for the 2011 season including two new hats and some new shirts. In order to get this special offer, you must submit your order through tickets@rockfordforesters.com. The deadline is April 29 by the end of the day. Visit http://stores.ebay.com/Scotty-Gear-Fraternity-Clothing/Rockford-Foresters-Baseball-/_i.html?_fsub=2088624014 to see the merchandise. The Rockford Foresters are pleased to announce an exciting season-long promotion that gives you the opportunity to win a two-night stay at the Isle Casino Hotel in Bettendoft, Iowa (that's the Quad Cities for those who don't know). In addition to the two-night stay, you will also get a $50 food credit at any of the Isle restaurant outlets as well as a $20 casino credit. How do you win? At every game for the Rockford Foresters in 2011, fans will receive an entry form that they will turn in at the customer service table. One lucky fan each game will be selected to participate in a home run competition before the last regular season game. The fan who hits a ball the farthest (doesn't have to be a home run) will win the package! Grand Rapids, Mich.- Bump up shifts after goals plagued the Rockford IceHogs on Sunday afternoon as the IceHogs felL..
Freeport, Ill. — One of the things Freeport softball coach Jeff Sands said the Pretzels were going to have to do better this season is come up with clutch hits when they need them most. We have all of our concessions figured out for the 2011 season and we have some great new products coming into Marinelli Field! Since today is National Potato Chip Day, we figured it was a great day to announce that we will be serving Vitner's Chips at the ballpark in a variety of flavors since they will be the "Official Potato Chip Company of the Rockford Foresters". Vitners is actually made in Freeport, which was a great selling point to us, in addition of course to the taste and all the flavors they have. Home Run Inn Pizza will be served at the stadium as the Official Pizza of the team, we will be serving Super Pretzels, Kelly Eisenberg Gourmet Beef Hot Dogs (Offical Hot Dog of the Team) and you will be able to purchase Bigs Sun Flower Seeds as well since they are the Official Sun Flower Seed of the Rockford Foresters. Fan this season will also be able to enjoy other new options such as nachos, numerous ice cream options like SpongeBob SquarePants & Dora the Explorer, Swedish Fish & Sour Patch Kids, cotton candy, popcorn, and brats. The Rockford Foresters Baseball Team, a summer collegiate wood bat team in Rockford, announced this morning "Senatorist Night" where once missing Wisconsin State Senators are invited back to Rockford to once again be tourists on Saturday, July 16 at 6pm at historic Marinelli Field. As part of Senatorist Night all 14 Wisconsin State Senators, who were once missing, will be invited to each throw out the first pitch at the Rockford Foresters baseball game. Also part of the festivities, all fans with the first names of the missing Senators (see names below) will get in the game for free. All union members (teachers, contractors, etc) will also get into the game for free if they present their union card. Fans who's first or last name is Walker, will be asked to pay their "fair share" of the Senator's ticket prices, which is $86 ($6 average ticket price multiplied by 14 tickets) - not literally. This is ONLY a promotion and we as the Rockford Foresters Baseball Team and anyone promoting this event is neither for or against unions or any other issue surrounding this situation. "Hosting Senatorist Night on July 16 is a humorous way to invite the once missing Wisconsin State Senators back to Rockford, where most found themselves curious tourists in Rockford visiting such places as the Clock Tower Resort," said Majority Owner/President Joe Stefani, "this is only a promotion and nothing more. These missing Senators at one point were tourists for a time being in Rockford." presentation of the league's Championship Trophy. baseball teams in the past." Rockford (WIFR) -- Rockford Christian held a pep rally for it's state bound boys basketball team. The Rockford Foresters and Marinelli Field are hosting the 1st Annual Rockford Foresters 5k Run on Saturday, August 13 at 9am at historic Marinelli Field, which is home to the Rockford Foresters Baseball Team. The race will begin on the outfield grass of Marinelli Field and conclude there as well. Each overall male and female winner will receive a trophy and the top two finishers (male and female) for each age division will walk away from the race with metals. The cost for the 5k run is only $25 until Friday, July 29 and includes a t-shirt as well as a goodie bag. After July 29, the fee is $30 and there is no guarantee of a t-shirt. Day of race registration is available and is $30 (no shirt guarantee). Visit http://www.rockfordforesters.com/news/?article_id=103 to register or for more information. 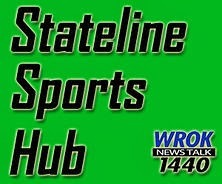 STATELINE - The Big Northern Conference recently announced its 2010-11all-conference selections for girls basketball. Hornet Rules Released, Bandits to Run Wednesday Nights, the rule are available at http://rockfordspeedway.com/node/434 as a downloadable PDF file. PRESS RELEASE (ROCKFORD FORESTERS) - The Rockford Foresters have announced that historic Marinelli Field will host a total of 98 events over 86 dates in 2011, which is a combination of events and Rockford Foresters' games. Marinelli Field will see majority of its events being baseball related. These baseball events include being the home field for the Winnebago High School baseball team, hosting high school baseball games for other high schools including Lena-Wislow, nearly four dozen days of youth baseball tournaments as well as Rockford Foresters baseball games. Besides baseball, Marinelli Field will host the annual Cinco De Mayo Festival, as it has done in the past, in addition to one other special event that will be announced later this week. "Hosting a large number of events was a goal of our group for 2011," said Majority Owner/President Joe Stefani. "These events will give great exposure to Marinelli Field and it will show to people near and far that Marinelli Field is returning to the greatness it once had. We feel that these events are a good starting point for the future in making Marinelli Field a destination for events nearly year-round." A break down of the events below will show how Marinelli Field will be utilized. The Rockford Foresters do have some open dates for other events. To get more information, please contact the Rockford Foresters main office at (815) 312-2115. WIFR - The Auburn Knights won their 2nd regional title in 3 season with 59 to 43 win over the Titans. - Age is determined as of August 1. Age is determined as of March 1 for 4 year olds.